In the far reaches of West Campus, thousands of specimens await discovery. They sit in cabinets, drawers and jars of ethanol, until they are needed for research. Tiny, handwritten tags tell their life story. Collection years range from the mid-1800s to present day. Some came from as far away as the Philippines, while others were found closer to home, near Lake Erie. Some specimens are common, like thrushes that could be found in any Ohio backyard. Others — like the Eskimo Curlew — were collected abroad and are now likely extinct. This diverse group of creatures makes up the Museum of Biological Diversity’s prized tetrapod collection. Containing mammals, birds, amphibians and reptiles collected by Ohio State faculty and staff across decades, this collection is vital to the greater scientific community as a repository of research subjects for future study. With this purpose in mind, the safety and continued preservation of specimens is the museum’s top priority, says Angelika Nelson, former curator of the collection. Although many animals in the collection have been dead for years, they still provide a valuable service, especially as research goals and methods change over time. The collection’s mission is becoming more crucial, as more animals that were once common become endangered or extinct. Luckily, the safety of the museum’s tetrapod collection has been ensured thanks to alumna Jennifer Foren ’14, whose contributions have helped the museum enormously. The biology and studio art graduate donated $50,000, specifically to the tetrapod collection. Foren, who worked at the museum as a summer research fellow, says the focus of her contribution is on meeting the collection’s immediate needs. One of those needs was for special cabinets on wheels that could be easily moved in an emergency, to store some of the collection’s most valuable specimens. This includes crucial “type specimens” — specimens researchers use to identify and classify species. The collection still stores some of its specimens in heavy wooden cabinets. In the event of a fire, many of the 25,000 tetrapods might be lost. While Foren’s desire to contribute to the museum is fueled by a lifelong love of animals and her formative summer research experience, she also cherishes her Ohio State experience as a whole. After growing up in Ohio and working for the U.S. Army in Japan, Foren values the time she spent at Ohio State, saying it gave her the greatest sense of community out of all the places she’s lived. As a summer fellow at the Museum of Biological Diversity, Foren conducted research in bird egg shell reflectance and contributed to the museum’s preservation efforts. 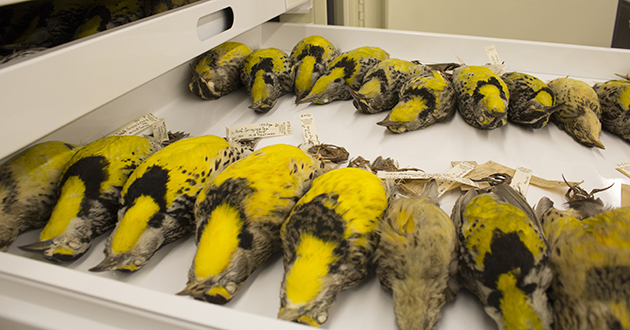 To preserve bird specimens, Foren prepared and cataloged bird carcasses, a task not everyone outside the walls of the museum understood. Although the museum is open to the public only on a limited basis, Foren calls it a “hidden gem,” and feels it’s important that more people know about the work that’s being done there. In addition to the tetrapod collection, the museum houses Ohio State’s Borror Laboratory of Bioacoustics, as well as collections of fish, fungus and insects.